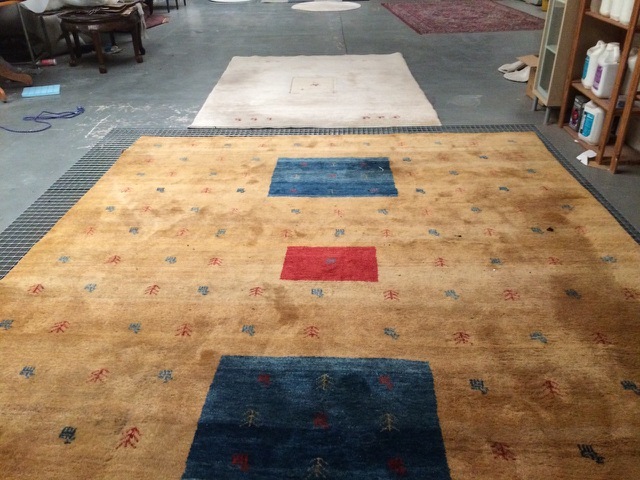 When you invest in a unique Gabbeh Rug, you need to be sure that it is cleaned by a professional who is fully trained, experienced and insured to protect your valuable investment. A Gabbeh is rug that is handmade in Persia and probably woven by a Quashai weaver from Iran, so is not easy to replace if anything goes wrong. SJS provide a complete collection and delivery service, as the treatments need to be spaced apart for 24 to 48 hours and each colour needs to be tested individually for colour run and shrinkage before we start. The designs of most Gabbeh rugs are based on geometric forms and have aa long pile that is un-clipped which translates to the word Gabbeh. Some Gabbeh rugs are woven in colours of brown, beige and ivory using wool in its natural undyed colours. The modern trend is to fill them with coloured wool in patterns, which might be images of camels or trees, or a random pattern of an animal figure or sunset onto the natural yarn background. You may see a Gabbeh with figures or shapes in bright jewel tones that standout from the browns and beige base colours and they look stunning in rooms that are informal with plain coloured walls rather than a patterned wall covering. You may have an Indo-Gabbeh rug which has been woven in India as a copy of the Persian Gabbeh styles. These are easy to recognise, being much stiffer with very little variation in colour, from the hand-spun wool shades used in the Persian made Gabbehs. Gabbehs are known for their ethnic beauty and charm and have flooded onto the western market since the year 2000, as they are a little less expensive than the traditional and formal pattern Persian rugs, but just as collectable.